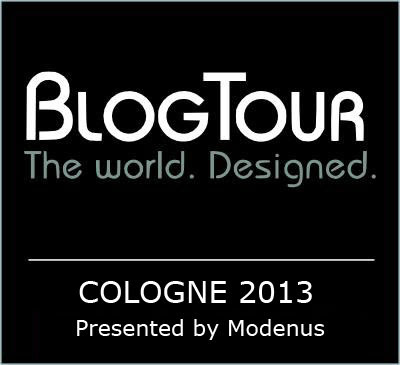 MoD Design Guru - Fresh Ideas + Cleverly Modern Design: Heading to BlogTour Cologne 2013! Something has happened and I am ready to start howlin’ about it! In mid Janurary, I will be struttin' my stuff around Cologne, Germany and yeah, Amsterdam too with 14 other designer and bloggers for BlogTour Cologne 2013, hosted by Modenus. Amid all the good food, beer and wine, we will be absorbing amazing trends, products and inspiration at sponsored events and the IMM Cologne, an international furniture and design trade show focusing on innovative materials, fabrics and architectural lighting design technology. Our amazing host, Modenus, an informative online design resource has pulled this BlogTour together. Veronika Miller, Tim Bogan and Erin will be supplying us with more of the details soon, so stay tuned! Meanwhile, take a peek at the list of fabulous designers above by clicking the 'Meet the Bloggers' link. Once the tour starts (Jan 13-18th), you will be able to follow any one of these designers/bloggers via Twitter (#BlogTourCGN), Facebook, Pinterest and Instagram. I wear this badge with honor! Thank you, thank you Modenus! !